For other uses, see Selkirk (disambiguation). 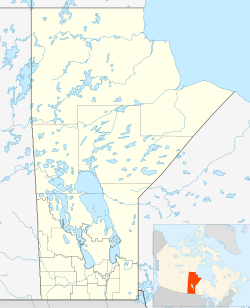 Selkirk is a city in the western Canadian province of Manitoba, located on the Red River about 22 kilometres (14 mi) northeast of the provincial capital Winnipeg. It has a population of 10,278 as of the 2016 census. The mainstays of the local economy are tourism, a steel mill, and a major psychiatric hospital. A vertical lift bridge over the Red River connects Selkirk with the smaller town of East Selkirk. The city is connected to Winnipeg via Highway 9 and is served by the Canadian Pacific Railway. The city was named in honour of Scotsman Thomas Douglas, 5th Earl of Selkirk, who obtained the grant to establish a colony in the Red River area in 1813. The present-day city is near the centre of the 160,000-square-mile (410,000 km2) area purchased by the Earl of Selkirk from the Hudson's Bay Company. The first settlers of the Red River Colony arrived in 1813. 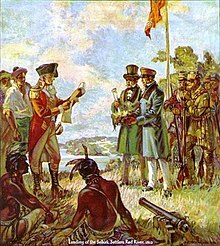 Although the settlers negotiated a treaty with the Saulteaux Indians of the area, the commercial rivalry between the Hudson's Bay Company and the North West Company gave rise to violent confrontations between the settlers and the trading companies. In recognition of the Earl's importance in bringing settlers to the region, the town was named Selkirk and incorporated in 1882. The Keenora in the Manitoba Marine Museum. The Selkirk Mental Health Centre, the largest mental health facility in the province, is a major employer in the city. The Centre's surroundings are a park-like campus on the outskirts of the city. Gerdau, owned by Gerdau S.A. of Porto Alegre, Brazil, operates a steel minimill in Selkirk. This steel mill (known locally as MRM or "The Manitoba Rolling Mills") is also a major employer. Selkirk is advertised as the Catfish Capital of the World, due to the large amounts of catfish in the nearby Red River. This nickname was part of an advertising campaign to entice American anglers, who travel to Manitoba to fish for trophy-sized catfish. Selkirk is also home to Chuck the Channel Cat, a fiberglass representation of a catfish that measures 25 feet (7.6 m) long. The name Chuck was chosen to honour local sport fisherman Chuck Norquay, who drowned while doing what he loved best — fishing in the Red River. After Chuck was built in 1986, the town council decided to place Chuck in front of Smitty's Restaurant on Main Street. The Marine Museum of Manitoba, a collection of historical marine artifacts of Lake Winnipeg and the Red River area, is located in Selkirk. Selkirk is also the site of a Canadian Coast Guard base. The Selkirk Fair and Rodeo is held annually to celebrate the area's agricultural history. It celebrated its 130th anniversary in 2008. Selkirk has three community newspapers: The Interlake Enterprise, The Selkirk Record, and The Selkirk Journal. Amphibex excavator icebreakers were at work breaking up ice flows on the Red River in 2009. Ice breakers and backhoes were to be strategically placed along the Red River Floodway, which might have needed to be opened before the ice was fully melted. Officials examined past ice jams and provided contingency plans if the Floodway jammed upstream of bridges or on tight corners. Selkirk is home to the Selkirk Steelers of the Manitoba Junior Hockey League, who play in the Selkirk Recreation Complex. Selkirk is also home to the Selkirk Fishermen of the Keystone Junior Hockey League. Selkirk has hosted major events in conjunction with the city of Winnipeg, such as select games of the 2007 Women's World Ice Hockey Championships. In 2009, Selkirk was host to the Telus Cup, Canada's national midget hockey championship, with the Winnipeg Thrashers as the host team. The Notre Dame Hounds defeated the Calgary Buffaloes 4–0 in the gold medal game, which was broadcast live from Selkirk on TSN. Selkirk is also the home of the Selkirk Curling Club which has hosted numerous curling events, including the Masters Grand Slam of Curling in 2014, Canadian Junior Curling Championships in 1997 and the Viterra/Safeway Select Manitoba Men’s Provincial Curling Championships. Selkirk is located in the Interlake Region of Manitoba, about 22 km northeast of the provincial capital Winnipeg on the Red River. A vertical lift bridge over the Red River connects Selkirk with the smaller town of East Selkirk. The city mostly borders the Rural Municipality of St. Andrews, except to the east, where it borders the Rural Municipality of St. Clements across the Red River. The terrain is extremely flat with fields of wheat and canola surrounding the city. Due to Selkirk's position on the edge of the Canadian Prairies, there is a moderate 510.4 mm (20.1 inches) of precipitation annually. Selkirk has a climate with four very distinct seasons. A general year will include warm (sometimes hot) summers, cold winters, and a comfortable spring and autumn. Selkirk has recorded a temperature as high as 38.5 °C (101.3 °F) in June 1995 and a temperature as low as −45.6 °C (−50.1 °F) in February 1966. Selkirk has 21 days with snowfall per year, from about November (sometimes as early as September or October) to around April (sometimes as late as May). Selkirk had a population of 9,834 people in 2011, which was an increase of 3.4% from the 2006 census count. The median household income in 2005 for Selkirk was $42,502, which is below the Manitoba provincial average of $47,875. Selkirk Park in February 2012. ^ Selkirk Mental Health Centre. - Province of Manitoba. ^ History Archived 2008-10-07 at the Wayback Machine. - Selkirk Fair and Rodeo. ^ Ice Hammer Archived 2010-10-06 at the Wayback Machine Discovery Channel. Accessed: 8 January 2011. ^ Skerritt, Jen (2009-04-04). "Flood fight ramps up as Red's crest approaches". Winnipeg Press. Retrieved 2009-04-06. ^ a b "Canadian Climate Normals 1971–2000". Environment Canada. Retrieved 24 January 2013. ^ "Canadian Climate Normals 1971–2000". Environment Canada. Retrieved 24 August 2012. 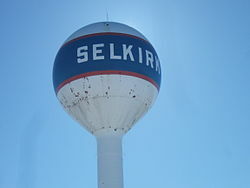 ^ "Selkirk, Manitoba - Detailed City Profile". Retrieved 2012-08-24. Wikimedia Commons has media related to Selkirk, Manitoba. This page was last edited on 20 April 2019, at 05:04 (UTC).